A chilly start to the year. After a fairly mild December, Winter has set up camp for the duration. Here are three pics from my first visit of the year. Delighted to find little to pump. Good so far with a nasty Northeaster on the way. Best wishes for a Happier New Year to all. Thanks for following along for another year. Looks like it may be a while for that first sail of 2018. Author RussPosted on January 3, 2018 January 3, 2018 Categories SjoginLeave a comment on Happy New Year! It’s true. This past Tuesday I checked my personal email after lunch and found a note from Mike R. who lives in the Kansas City area. I believe it was sent the day he launched his very own Sjogin named Gramercy, faithfully building to Paul Gartside’s Plan #176. 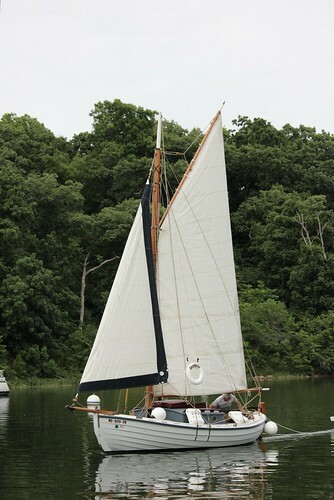 This is the gaff sloop version that Paul drew. 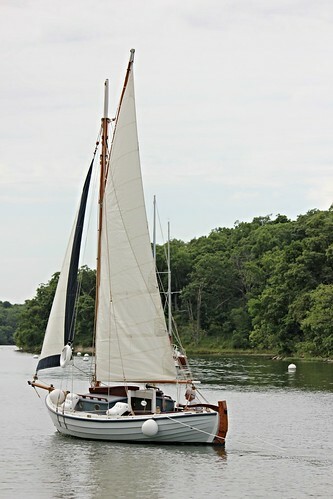 Mike used traditional construction, with steam bent oak frames and cedar planking. And she has a topsail! And to top it all off, this is the first boat he has built. That I’m shocked is to put it mildly. 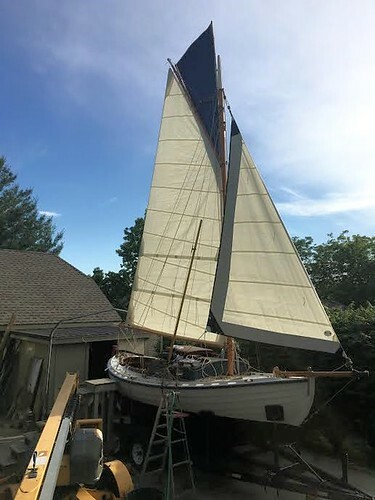 I know of several smaller versions under way and perhaps, as Mike has done, the full size version is being built somewhere, but this is Sjogin’s first sistership to my knowledge. Mike started in 2011, shortly after the plans were available. He said he built Gramercy “referencing 8 books, the internet, and the kindness of strangers”. He also mentioned auditing the WoodenBoat Forum and Hove to off Swan Point. 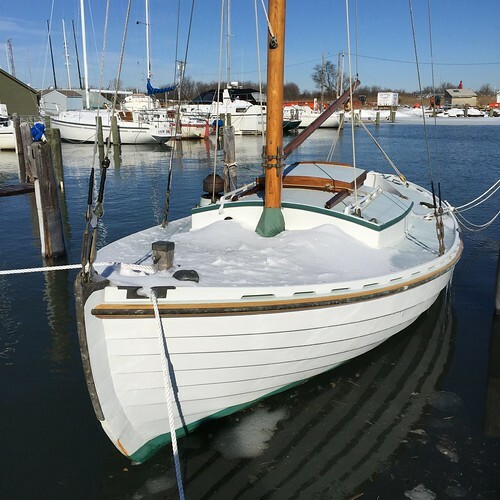 So here is Gramercy, Sjogin’s first sistership. I think Mr. Gullberg would be happy. I certainly am. He she is on what is probably her maiden sail with the proud builder at the helm. This happy Skipper sure is. She has traditional canvas decks and the same toe rails as her very older sister. That stern looks familiar. I find it hard to believe that the lines taken off Sjogin and faired by Paul Gartside have resulted in this little gem. Here she is in a driveway, setting up the rig. Note the topsail! Just think of the strings to pull. The sails are by Carol Hasse, the bronze work by Port Townsend Foundry and R&W Rope helped with the rope work. I’ll have some more photos soon, all of which were provided by Mike. After a decade of of asking the world if anyone knows of Sjogin’s origins, I’m no closer to an answer but now know she’s well worth at least one copy. One added benefit of building a copy of Sjogin is that it entitles you to an afternoon hove to off Swan Point in the original. Thanks again Mike, you certainly made my day. I’m sure there’s a good story here. Author RussPosted on July 3, 2016 July 3, 2016 Categories Sjogin1 Comment on Sjogin has a Sister Ship! Recently there have been a few comments on the Ourhouse Page that could use a wider audience. With the implied consent of Jppe, Peter and Colin here are the recent comments; mostly concerning Sjogin’s name origin. Here is Jppe’s Comment on Sjogin’s name. I was told by the widow of the second owner that the name came for a very loose anagram of his name, Joe Shinn. If you say the name to yourself you hear how easy to mash up the syllables. Though the suggestion that her name means sea-going has appeal. Even though she’s never been to sea as far as I know. Here’s the comment from Peter in Scotland. Further evidence of Sjogin’s cousins. Here’s the link to the Orkney Yole Association. 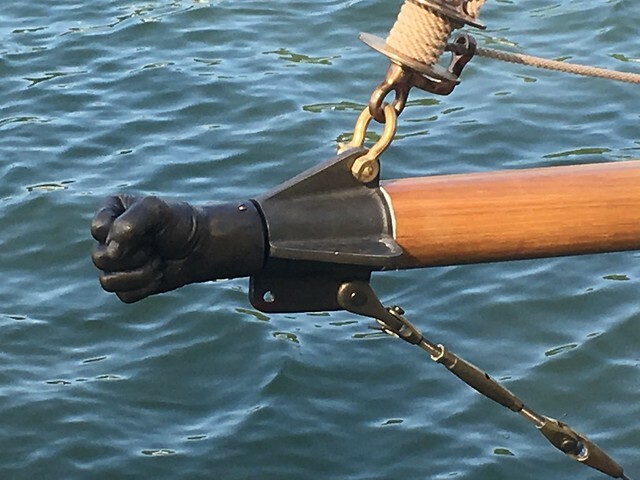 Seems the Yole’s have a finer stern with easy buttocks and a straight sternpost. Sjogin has a fuller stern and curved sternpost. Sure looks like she would be at home in the Orkneys. “I’ve been reading your blog with interest for some time now. I would agree with Jppe’s comments about the origins of your fine boat. Here in northern Scotland we share the same boat origins. We have developed over time our own version of Sjogin. We call them ‘yoles’ or ‘yawls’ and they have been tailored to suit the seas around us. I would refer you to the website of the ‘Orkney Yole Association’. I’m sure you will spot the similarities. Finally, here’s a comment from Colin, also in the Orkneys. Indeed, they are Viking designs all. Though the only thing this Viking lays waste to is sausage bread. 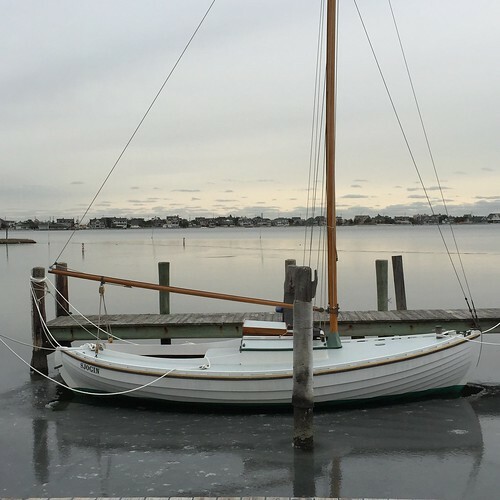 “I have been reading about you in WoodenBoat. I own an Orkney Yole named Bee from the island of Stroma. She is almost identical to Sjogin. 25ftLOA 10ft beam. The original boat was built in 1904 at Mey in Caithness in Scotland. I will send you pictures if you give me an email address. This is a Viking design! I sent Colin my contact details and look forward to posting pics of his boat. Of course I can’t miss an opportunity for a pic or two. Lightly frozen in a few weeks ago. Always cozy below. 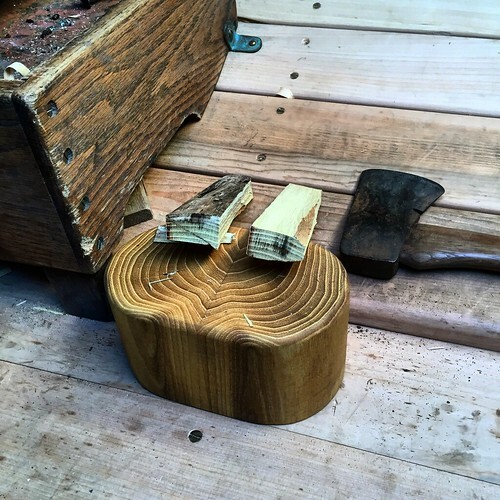 Sjogin’s new bespoke Paul Smith chopping block. Simple with a Sandy backstory.